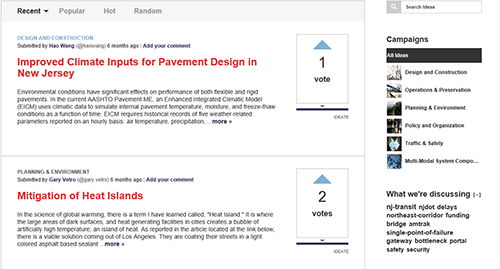 Participate in the NJDOT Transportation Research Ideas Collaboration Site! The New Jersey Department of Transportation’s (NJDOT) Bureau of Research invites you to participate in the NJDOT Transportation Research Ideas Collaboration site. We are asking NJDOT’s research customers and other transportation stakeholders to propose research ideas for the NJDOT Research Program. Join us in finding workable solutions to problems that affect the safety, accessibility, and mobility of New Jersey’s residents, workers, visitors and businesses. REGISTER TO PARTICIPATE. Once you are registered, you may submit ideas at any time. If you registered last year, you do not need to register again. NEXT ROUND OF RESEARCH. Please submit your research ideas no later than December 31, 2018 for the next round of research RFPs. The NJDOT Research Oversight Committee (ROC) will prioritize research ideas after this date, and high priority research needs will be posted for proposals. Questions about how to register?